People are tired of me harping on cops. I know it. They've told me so. It makes them mad. It hurts their feelings. It makes them... uncomfortable. They don't want to hear it. I understand why. But I'm not sure I want to stop. It's just too important for liberty to make sure to drive the point home, and to never let up. To never give an inch. Cops are where the boot heel of tyranny meets the human face. Without their active aggression, there would be no such thing as political power. The opinions of the bullies of the State would be nothing but a bit of hot air, quickly lost to the gentlest breeze. Next to cops, presidents are nothing. "Laws" are nothing. Corrupt prosecutors (but I repeat myself) are nothing. Power-crazed judges are nothing. Bureaucrats are nothing. The State is nothing. 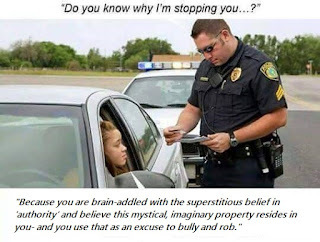 Cops are the one thing that makes government a problem for Rightful Liberty and those who exercise it. Nothing else even comes close-- no matter how evil and reprehensible other things may be. Yes, I understand it is tiresome to hear "Cops are scum" and "Cops are losers" again and again. But it is more important than anything else you can hear, with regards to liberty. It is absolutely crucial to understand why you can't support cops without polluting yourself; without being a part of the problem. It's just the way it is, and telling it the way it is makes people mad. And, yet I keep on. I try to be nice about it. I try to not get profane and angry like so many others I see. Quite honestly, I am not angry; I am persistent in speaking this irritating truth. Truth is mistaken for anger when that truth is painful. In my day-to-day life I don't worry about cops a tenth as much as some of the people I know who don't have a principled stance against policing-- simply because they fear being the target of police attention. Or because they worry that a cop will see them doing something "illegal" while driving. That's something I really don't worry about. It is what it is, and I'm not going to live my life worrying about those parasites. As with any gang, I avoid contact as much as possible. I recognize what they are, and I don't sugar-coat it. And I go on with my life, knowing they are utterly irrelevant and worthless in the grand scheme of things. But, I know it is something the population needs to keep being reminded of, because the cult is so ubiquitous and so generally popular. And because it is important.